The following is a repost of the guest post I wrote for the Bunny’s Review as part of my book tour with Orangeberry Book Tours for my latest book,The Greeks of Beaubien Street. Watch for the sequel, The Princess of Greektown, soon. You can read an excerpt here. When I first began to write full-time, I did so at the dining table. My laptop was across from my husband, who also works from home. This setting worked fine for two years. We were both quiet, the only distraction coming from our dogs when they wanted a bone or from the wildlife outside our windows when it was time to refill the bird feeders or put more corn out for the deer in the wintertime. My ideas were flowing so quickly that it wasn’t an issue if he had a conference call or an unexpected visitor or the UPS man interrupted me. Then reality hit. I began to write a book that required research and concentration. If my husband was having a business discussion with his partner, I lost my train of thought. If the dogs wanted attention, I got frustrated. It seemed that the most minor of annoyances could throw me completely off track and I would forget what I was writing. It was time for a private office. Leaving my husband and the wildlife view was difficult. There was a small, empty room at the front of the house; if I got lonely, we could yell to each other. The dogs could come and go. I decided I had to position my mother’s large old farm table in front of the window facing my sheep pasture. I put two bird feeders close by so I could watch the birds. Occasionally in the spring, wild turkeys pass across the lawn with their babies. It’s very tranquil. Items I love began to find their way to my tabletop. Ancient sepia photos of my grandparents and parents grace the background, along with those of beloved dogs now gone to the big kennel in the sky. A hand-thrown pottery cookie jar filled with dog bones sits in one corner next to a clear bowl of sea glass my Aunt Von collected out of the water off the village of Capitola in Santa Cruz County. 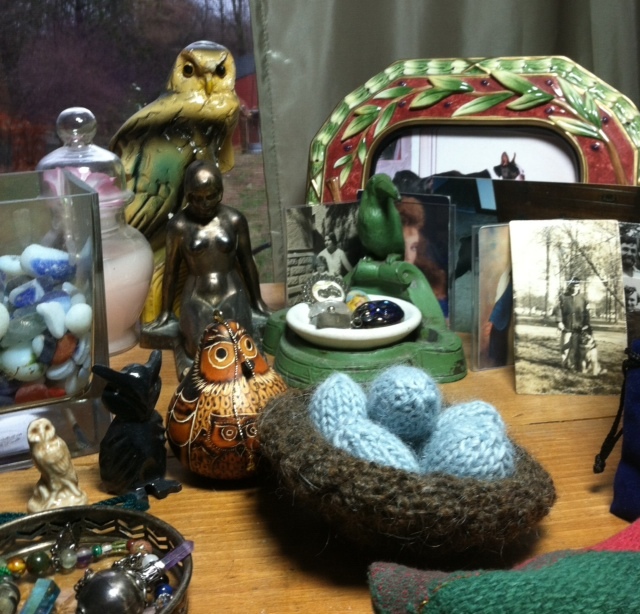 My owl collection includes pieces from my mother’s antique shop and gifts from my friend, Betty. I have a small bronze sculpture of a naked girl kneeling; I bought it for my dad and my mom gave it back to me when he died. From my daughter Jennifer, a pendant of Saint Anne, the patron saint of grandmothers and from my son Andy, a candle bought for Mother’s Day when he was fourteen. A nest my friend Cate knit with five knitted Robin-egg blue eggs is treasured. Things I love began to find their way to my desktop, which was reminding me more and more of an altar. The process of writing is almost worshipful, meditative. You must pull thought from the back of your mind and put it into words another human can make sense of. Doing so, and knowing that not everyone will find the same meaning in your collection of words is both intimidating and egocentric. I’m not sure if making an altar of my desk was intentional or accidental. I may have hoped it would help me be more successful at the task of writing. However, I think its real purpose is to comfort me. It’s a scary proposition to put it all out there. Writers know what they are inviting; criticism, ridicule, shame even. But it’s a compulsion. There is a story to tell and I must tell it. I’d asked myself at one time, “now Suzie, who is going to care about this?” It’s vanity, thinking a series of narratives compiled of some childhood boogeymen are worthwhile reading. So the writing-table becomes a sort of combination spring-board/cocoon. I am alternately withholding/expounding, hiding/exposing. Someday, I hope to make up my mind. I keep waiting for someone to have me arrested for writing tales that should be kept under wraps. My office is a safe haven for a dangerous occupation. *Please let me know where your favorite place to read and write is. I would love to hear about it. I remember loaning a book out years ago, and my friend called me up, laughing. She wanting to know if I’d been eating pistachios while I was reading. Embarrassed, I had to say yes; the book was full of tell-tale pistachio detritus. In my youth, I used to plan a reading binge to coincide with a snack binge. Now, in my old age, I can’t afford the calories. As a writer, reading fiction is a luxury, but when I find a writer who’s captured my attention, I love it. This entry was posted in Uncategorized, Writing and tagged places to write, reading nooks, safe places, spiritual places, writers inspiration by Suzanne Jenkins. Bookmark the permalink. Suzie, thank you for the mention. i’m so happy I gave you that nest with eggs. all the wonderful gifts you have given me – friendship, yarn, love, yarn, advice, listening, yarn, Beth, Gwen, Donna, Joanna, Rachel, Brenda, Elda, Tola, yarn, learning how to dye, spinning, yarn, laughter, laughter, laughter, yarn, wonderful stories to take me away, yarn — and all you got was a little nest and some eggs. I’m so glad it gives you joy. You mean the world to me. I love reading every word you write, Suzanne! The push-pull dichotomy in this piece is wonderful and thought provoking. Yes, well I love you, too.